Join Clinton in this 11-hour plus training diary of two gaited horses. At the start of the series, Clinton is faced with two challenges: A cold-blooded, lazy horse and a hot-blooded, reactive horse. Over a course of weeks, trained with the Downunder Horsemanship Method, the two horses transform into willing partners. The digital Gaited Horsemanship video series may be accessed on your mobile device using the Downunder Horsemanship app, which is a free download from the App Store and Google Play, and on your computer through the Downunder Horsemanship website. Clinton takes each horse through his Fundamentals level groundwork program, gaining their respect and trust. His commentary as he works with the pushy, lazy horse and the fearful, reactive horse will prepare you to work with any type of horse. You’ll see firsthand how groundwork carries over to under saddle work and how gaining control of all five body parts results in a better gait. With exercises such as the One Rein Stop, the Cruising Lesson and Flexing, both horses become responsive and relaxed. The horses are reunited with their owner who demonstrates the noticeable difference in their attitude, responsiveness and ability to smoothly gait. 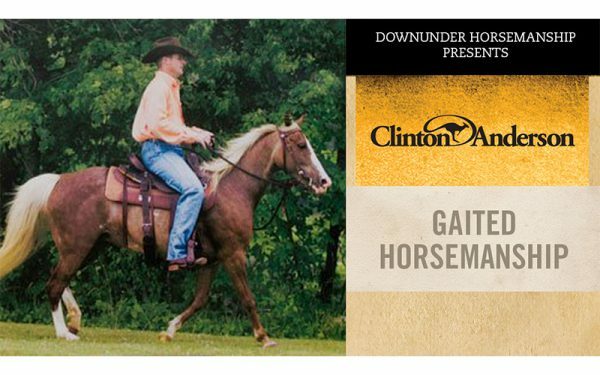 The in-depth series provides every gaited horse enthusiast with the means for achieving a willing partner.